If you are a registered user and post to any of the Site's community forums, other registered users of this Site may view your username and may send you emails, but they will not be able to see your actual email address. We may use your personally identifiable information to send you advertisements and other promotional information regarding our products and services or the products and services of our third party marketing partners and other communications related to the Site. Imperia Pasta Machine recognizes the privacy interests of children and we encourage parents and guardians to take an active role in their children's online activities and interests. No personally identifiable information is collected by Imperia Pasta Machine and Imperia Pasta Machine's services and Site are not intended for children under the age of 13. 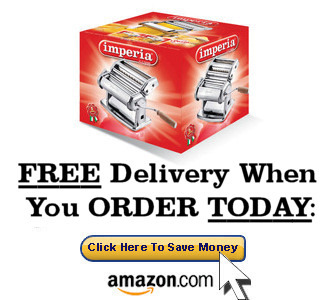 Imperia Pasta Machine does not target its services or this Site to children under 13. Imperia Pasta Machine does not knowingly collect personally identifiable information from children under the age of 13. Advertisements that appear on this Site are delivered to users by our advertising partners. Our advertising partners may download cookies to your computer. Doing this allows the advertising network to recognize your computer each time they send you an advertisement. In this way, they may compile information about where you, or others who are using your computer, saw their advertisements and determine which advertisements are clicked. This information allows an advertising network to deliver targeted advertisements that they believe will be of most interest to you. Imperia Pasta Machine does not have access to or control of the cookies that may be placed by the third party advertisers. Aggregate InformationThe Site may track the total number of visitors to our Site, the number of visitors to each page of our Site, IP addresses, External Web Sites (defined below) linked to, and we may analyze this data for trends and statistics in the aggregate, but such information will be maintained, used and disclosed in aggregate form only and it will not contain personally identifiable information. We may use such aggregate information to analyze trends, administer the Site, track users' movement, and gather broad demographic information for aggregate use. We may share this aggregate information with third parties to assist them in targeting advertisements to appropriate audiences. We will also disclose your personally identifiable information if we reasonably believe we are required to do so by law, regulation or other government authority. We will not sell your personally identifiable information to any other company or organization except that we may transfer your personally identifiable information to a successor entity upon a merger, consolidation or other corporate reorganization in which Imperia Pasta Machine participates or to a purchaser of all or substantially all of Imperia Pasta Machine's assets to which this Site relates. We may employ procedural and technological measures, consistent with industry practice. Such measures are reasonably designed to help protect your personally identifiable information from loss, unauthorized access, disclosure, alteration or destruction. Imperia Pasta Machine may use encryption, secure socket layer, firewalls, internal restrictions, password protection and other security measures to help prevent unauthorized access to your personally identifiable information.